With the development of Low Earth Orbit satellites, differential code biases (DCBs) estimation based on onboard observations has been widely studied. In this study, onboard observations of BDS and GPS satellites by the Chinese Fengyun-3D (FY-3D) and Fengyun-3C (FY-3C) satellites are applied to estimate BDS and GPS DCBs. Since only the code observations of C1C and C2W for GPS, and C2I and C7I for BDS are tracked by FY-3D and FY-3C, the DCB types of GPS C1C-C2W and BDS C2I-C7I are estimated with code multipath considered. First, the DCB estimates based on FY-3D onboard observations are analyzed. 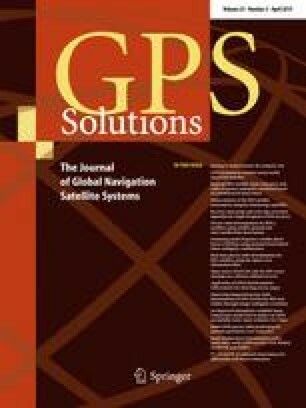 When jointly processing BDS + GPS onboard observations, the stability of satellite and receiver DCBs for both BDS and GPS has better consistency with the DCB products of the German Aerospace Center (DLR) and the Chinese Academy of Science than that for the single-system solutions (BDS-only solution and GPS-only solution). This is reasonable because more onboard observations are used in BDS + GPS solution, which can improve the strength of the DCB estimation. The variations of receiver DCB are analyzed as a function of geomagnetism and solar activity, but little relationship between them has been found. Compared with the FY-3C solution, the FY-3D solution can achieve a more stable satellite DCB with a stability improvement of 33%, 48%, 62% and 56% for GPS, BDS GEO, IGSO, and MEO satellites, respectively. Meanwhile, the receiver DCB of FY-3D is more stable than that of FY-3C as well. These improvements of satellite and receiver DCBs can be due to the enhancement of FY-3D GNSS Occultation Sounder (GNOS) instrument, which provides more observations with higher quality. Furthermore, both FY-3D and FY-3C onboard observations are processed together to estimate BDS and GPS DCBs. Compared with the FY-3D solution, the stability of satellite DCB can be improved by 16%, 9% and 7% for GPS, BDS GEO and IGSO satellites DCB, respectively, when both FY-3D and FY-3C onboard observations are jointly processed. The impact of DCB estimation on estimating the vertical total electron content (VTEC) is also investigated. Compared with FY-3D GPS-only and BDS + GPS solutions, the VTEC estimates along the FY-3D orbit can achieve more realistic results for FY-3D + FY-3C solution. We would like to acknowledge DLR and CAS for providing access to the multi-GNSS products of differential code biases (DCBs). We are very grateful to the reviewers for their helpful remarks for improving this paper. We also sincerely thank Wenjin Yang for her kind support. The numerical calculations in this paper have been done on the supercomputing system in the Supercomputing Center of Wuhan University. This research was funded by the National Natural Science Foundation of China (Grant No. 41774030), the Hubei Province Natural Science Foundation of China (Grant No. 2018CFA081), and the National Youth Thousand Talents Program.